By Mary Awad on September 29, 2016 for Inside Fordham. On Sept. 28, there were more than just animals on display at the Bronx Zoo. Fordham University students gathered in the Schiff Family Great Hall to take part in the 4th Annual Bronx Science Consortium Poster Symposium. The event was a presentation of student research on the high school, undergraduate, graduate, and post-doctoral levels. J. Alan Clark’s keynote talk was on penguins’ calls and responses. J. Alan Clark, Ph.D., associate professor of biology and an avian expert, shared his doctoral study on penguin vocalizations. He documented the calls of feeding and mating Spheniscus penguins and tested the penguins’ responses to the calls. “Look for something that interests you, and when you see something weird, question it. There’s a wonderful world to explore, so always keep exploring,” he said, adding in jest they should “become rich and famous” as well. One of the groups of high school students from Fordham’s Project TRUE (Teens Researching Urban Ecology) presented a project on what kind of small mammals live within the Zoo’s enclosure. The Project True project is the result of a $2.6 million grant Fordham received with the Wildlife Conservation Society in order to teach and train local high school students in ecology and other STEM subjects. 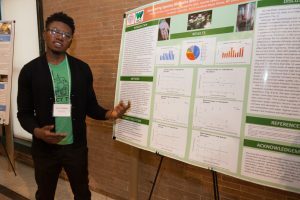 Frimpong presented his work on species richness in soils. The study discovered seven dominant species of mammals that roam free within the zoo, the most prominent being white-footed mice. Fordham undergraduate and graduate students were also in attendance. 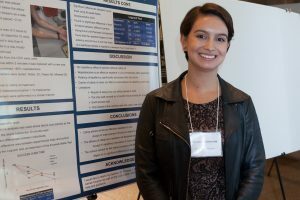 Jacqueline Heffner, a Rose Hill junior majoring in physics, discovered a way to detect the presence of the HPV virus without long, drawn out tests. By creating a microsphere, she was able to decipher whether the virus was present based on shifts in the air’s frequency near the sphere’s edge. By testing for HPV infections this way instead of using biosensors, Heffner believes that diagnosis and treatment can begin more quickly. Sieverson’s work was sponsored by Fordham’s CSUR program. 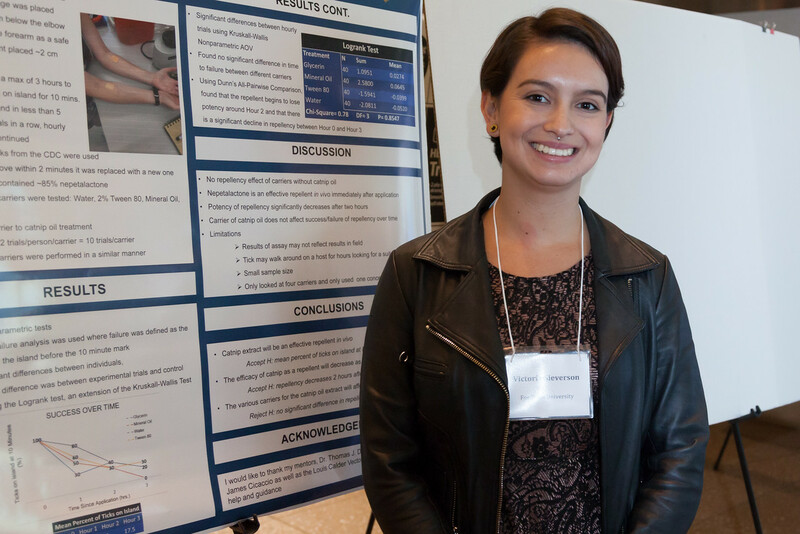 Fordham senior Victoria Sieverson’s project addressed the positive benefits of catnip. In her study, she tested the effectiveness of pantolactone, an active ingredient in catnip, as a repellent against blacklegged ticks. “The catnip was effective in repelling the ticks away from human skin for about two hours. When I eventually come back to this project, I want to increase the concentration levels to see if I can get it to last longer,” said Sieverson. In all, some two dozen posters were presented. 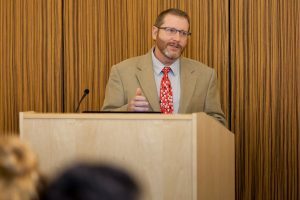 The projects were created in conjunction with the Bronx Science Consortium, an educational partnership of five Bronx institutions that focuses on bringing together science research and intellectual support from its partners.